Usually, once the past has been put to rest, it stays there. But, as the Stetson-King family begins the final steps on their journey to the future, they discover that the past not only has an uncanny way of reemerging when they least expect it, it might even alter the future. The adventures of Lee and Amanda continue on Friday March 6th at 8pm ET. Dr. Smyth’s elegant paneled office was dim and quiet, but not unoccupied. A thin thread of smoke arose from behind the big leather chair which was turned away from the desk, facing the wall behind. There was a quiet air of expectance about the place. The muffled ring of a hidden telephone broke the silence. The chair turned to reveal Austin Smyth-the head of the Agency. He opened a desk drawer and pulled out a telephone receiver. “Don’t worry. I have everything under control. ‘Operation AnniPar’ is right on schedule.” Francine’s smile slipped a bit as she listened to her partner in crime. Hanging up the phone, she shook her head in frustration. For the umpteenth time, she wondered how she’d let herself be roped into this. If it didn’t concern the two people she counted among her closest friends, she certainly wouldn’t have gotten this involved. It would all be over by tomorrow night, and then her life could get back to some semblance of normality. She clipped her earring back on her lobe, stood, and tugged down the jacket on her Chanel suit. Her long stride ate up ground as she hurried out of the Bullpen toward the elevator that would take her up to the Georgetown Foyer. She ducked under the camouflage coats and emerged just in time to see the objects of her quest collect their identification badges from Mrs. Marston. Amanda looked exhausted as she stood next to Lee, his right hand supporting her lower back, his left hand resting protectively on her distended stomach. Dark circles marred her usually flawless peaches and cream completion. Francine imagined sleeping had to be difficult, and carrying all the extra baby weight around couldn’t be easy. No wonder the perky agent had slowed down a bit. “Good morning, Francine,” Lee and Amanda chorused together. Francine turned and pushed the elevator button. The doors slid open, but Amanda’s voice stopped her from slipping back under the coats. Flipping through her mental Rolodex, she tried to find something, anything to satisfy Amanda’s curiosity. Then, like a flash of lightning, the phrase “need to know” popped into her head. She could honestly tell Amanda “AnniPar” was need to know, and, at this moment, Amanda didn’t have a need to know. “Sure. I’d love to join you, as long as nothing vital happens between now and then. Around twelve-thirtyish.” She slipped into the closet elevator, and once the doors closed, heaved a sigh of relief. “Operation AnniPar” was still top secret. The open-backed Jeep bounced along as the driver maneuvered it across the desert road. The occupants rode in silence heading towards their destination. They had been on this desert road for several hours, and they were tired and weary. It was a surprisingly cold, dark night even by Egyptian desert standards. A light wind had picked up and was blowing little granules of sand in their faces. The driver glanced to his right and smiled at his wife, who was holding their two-year-old son in her lap. Their son was sleeping soundly, sucking on his thumb. Realizing he was looking at her, she turned to him and smiled back. “You’re awfully quiet tonight, Mrs. Stetson,” he said, breaking the silence between them. “It’ll be over soon enough, my dear.” He gently squeezed her hand before returning his to the steering wheel. “And if I thought there was any danger at all, I wouldn’t have brought the baby.” Out of the corner of his eye, he saw her nodding her head in agreement. They continued to follow the river for a while, noticing the gradual change of the scenery as they neared the city. Signs of habitation became more common, the closer they drove to the capital the denser the urban sprawl appeared. In the city, the dirt and squalor was obvious and horrific to Western eyes and poverty was rampant. Gradually the streets became cleaner and wider as they entered the quarter where foreigners had gravitated, to be near their embassies. “We’re here,” he sighed with relief as he drove the Jeep through the wrought iron gates. “We’re supposed to be meeting a James and Emily Woodward.” He steered the vehicle around the circular driveway parking near the front steps of the embassy complex building. A special thanks to Julie Faith Rigby for the story idea. She felt like she was having an out-of-body experience. The nausea was overwhelming, the pain unbearable, and everything was happening in slow motion. Her eyes burned from the bright overhead florescent lights; she heard voices and saw distorted faces, but couldn’t make them out. Then she heard a high-pitched siren-no, not a siren, a newborn baby crying. Collapsing onto the bed from exhaustion, she lost consciousness. “I’m sorry, but your baby was stillborn.” Dr. Andersen put his hand on her shoulder. Four men entered a dimly lit basement. Amanda and Francine were finishing their lunch at a small tea house. Francine had suggested it because they had readers who would come to your table if you asked. The table was cleared and the young tarot reader came and sat with them. “Hello, Annie.” Amanda smiled warmly back, even though she was not totally sure about getting a tarot reading. “Hi Amanda! I see you’re probably not here about love and romance.” Annie gestured to Amanda’s moderate belly. “Let’s start with Francine—then you can see how it goes.” Annie pulled out a worn oversized pack of cards from a decorated cloth bag, and handed them to Francine. Francine shuffled the cards and cut them into three piles to the left with her left hand. She thought a moment, and then pointed to the middle pile. Annie picked it up, and then Francine pointed to the right hand pile, and Annie picked that one up and put it under the first, and then the last pile under the others. Francine nodded in acknowledgment with a resigned look on her face. The next card showed a heart pierced by three swords. “And it ended badly—did he leave you?” Annie asked. When a career spans 50 plus years, it’s hard to define an actress in a specific way. But for most of us, Beverly Garland was a spunky but sincere mother figure. 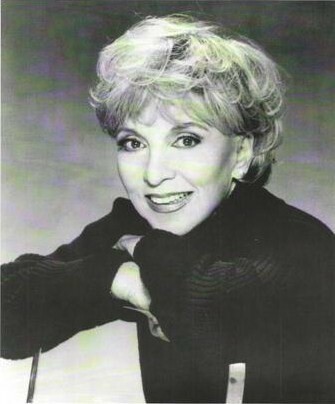 It started way back in the 70′s when she became the mother to three rambuncous boys in My Three Sons and continued all the way into playing Annie’s nutty stepmother in 7th Heaven in 1997. Along the way she was the mother of two spies, a reporter with a superhuman boyfriend, and a crazy woman living in Port Charles. I was fortunate enough to be one of the lucky few to meet Ms. Garland at her hotel during the 20th Scarecrow and Mrs. King reunion and she was more spunky and fun in person than she could ever portray through her characters on television. She was as honest as the day was long and wasn’t ever afraid to say it like it was. After 50 years in a business that stomps on the little people she stood proud and managed to make lots of great friends along the way. There was a great deal of disappointment when it was discovered she was too ill to attend the 25th reunion this year and the rumors about her health that we were able to ascertain from the employees there were not good. You will always be remembered Beverly, for your smile, your candid manner, and the hours and hours of wonderful entertainment you gave to us all. Dark clouds hung low in the sky. He didn’t think he’d make it before they released their fury and drenched the earth. As he turned the corner, thunder boomed and lightning flashed across the sky. A large drop of rain hit the windshield. Then another. And another. The heavens opened up, sending down a pouring sheet. He turned on the windshield wipers. Nothing. Then he noticed the left turn signal blinking. He switched it off and found the correct switch. He hated this damn car. But he didn’t have a choice at the moment. It was the only vehicle available at short notice. Unfamiliar with the car, he gripped the steering wheel when he felt the car slide slightly to the right. He eased off the gas; an accident was the last thing he needed. At long last, his destination loomed in sight. He followed the line of cars turning at the intersection into the parking lot. A flash of lightning illuminated the sea of vehicles in front of him. Great. He’d have a hell of a time finding a spot to park. He drove slowly up and down the lanes, looking for the telltale sign of red brake lights signaling someone would be leaving and a cherished spot would be available. It seemed like he circled the lot for hours. But when he checked his watch, he saw that only ten minutes had passed. The rain started to let up. Instead of a downpour, it became a steady drizzle. He rolled down the window a tad to let some fresh air in and help clear his head. He needed a clear head to complete this mission. As he tooled the car up another lane, a figure carrying a black umbrella and several bags passed him. Coming to almost a complete stop, he shadowed the man in hopes that he had a car parked in this lane and he’d be able to snag the spot. Luck was on his side this time. The man walked to a car just ahead of him and opened the driver’s door. Within moments, an engine roared to life. He turned on his blinker. Just as the car backed out, another one came down the lane from the opposite direction in an attempt to steal the space. Thankfully, his driving expertise came in handy, and he managed to swing around the departing car and claim his prize. After grabbing his umbrella, he stepped out of the car and found he didn’t need it. But a glance at the sky told him he’d better take it because it looked like the storm wasn’t over yet. Black clouds swirled, and thunder rumbled in the distance. Each step closer and closer to the entrance filled him with dread. Never in a million years did Lee Stetson think he’d be entering a grocery store on the morning of Thanksgiving Day. Before entering, he looked back and scowled at the hideous Mercury Zephyr. It stuck out like a sore thumb. He despised that car as much as Phillip did, but Dotty had taken Amanda’s car to pick up Curt, and the ‘Vette was in the shop for routine maintenance. Even though the Mercury wasn’t what Phillip had originally wanted, Amanda had picked it out, telling him it was something he could tinker with to his heart’s content. In the long run, that had been fine with Lee; his beloved ‘Vette would be safe from the teen’s hands. The holiday season has arrived but will there be anything normal about this Thanksgiving for Lee and Amanda? From misadventures in the grocery store and along the highway – as well as the makings of a new case right in their own backyard – it’s anybody’s guess as to whether the cranberry sauce and pumpkin pie will actually make it to the table. So, hold on to your turkey and stuffing – and stay tuned for the all-new and exciting episode of Scarecrow and Mrs. King, premiering on Wednesday November 26th at 8pm ET.